Even today, Gregory Maguire, author of the bestselling “Wicked,” gets lost in C.S. Lewis’ world of Narnia. And so begins “The Lion, the Witch and the Wardrobe” of the “The Chronicles of Narnia,” the beloved children’s novels by C.S. Lewis that have sold more than 100 million copies and have been translated into 46 languages. Friday marks the 50th anniversary of Lewis’s death. He died from renal failure in 1963 at the age of 64. It was one week before his 65th birthday. Gregory Maguire spoke to chief arts correspondent Jeffrey Brown about the Narnia series and C.S. Lewis’s influence on the world of fantasy and Maguire’s own construction of Oz. Listen to the whole conversation. 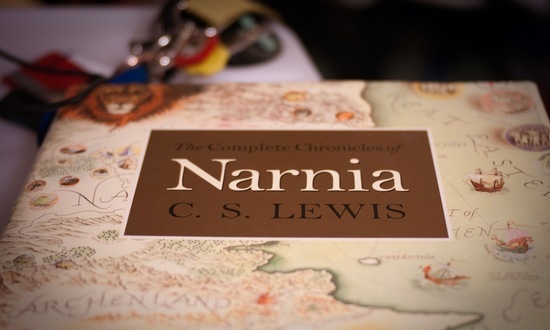 Still, the seven installments that comprise “The Chronicles of Narnia” are his most well-known. 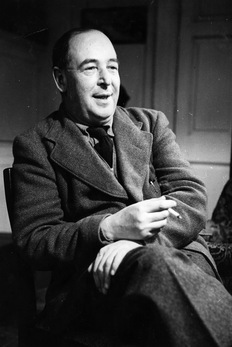 According to Maguire, who is also a scholar of children’s literature, Lewis was hugely influential for both children’s literature and fantasy alike. In fact, Maguire says, “You only have to open any book and you see, the wardrobe has many imitators.” One such imitator he points out comes from Philip Pullman’s 1995 “The Golden Compass.” Maguire points to a scene early in the book when Lyra, the protagonist, hides in a wardrobe to eavesdrop on her uncle in Oxford. For Maguire, Narnia was magical. Lewis created this world over his whole lifetime. He drew from the stories that his Irish nurse would tell him as a child. Several years later, at the age of 16, Lewis fantasized about a faun carrying parcels and an umbrella through a snow-covered forest. And then, during World War II, Lewis was inspired by four children who stayed at his country house. 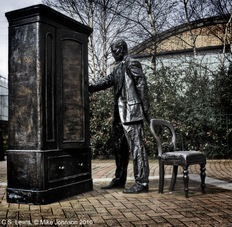 When he finally sat down to write “The Lion, the Witch and the Wardrobe,” Lewis called on his memories, including sitting in an old wardrobe with his brother, and his youthful imaginings to create the Narnia known today. While Lewis was exploring his make-believe world, his close friend J.R.R. Tolkien was creating Middle Earth in “The Lord of the Rings” series. Together, the two created syntax for fantasy writing that is widely used today, but according to Maguire, they did so in almost opposite ways. “The differences between Middle Earth and Narnia … are really vast because Narnia is built on the back of existing conventions,” Maguire says. “There’s a bit of Father Christmas there, there’s a bit of Christianity, there’s a bit of the Odyssey, there’s a bit of the Arabian Nights. Little scraps and bits and tatters from everything on the bookshelf that interested Lewis.” Tolkien wanted to create a whole new world that concealed his roots. He tried to “make something … new as if it had never been sighted before,” Maguire says. Three major motion pictures have already been made from the Narnia series and the fourth, “The Silver Chair,” is in development. Check out the slideshow below to view “The Lion, the Witch and the Wardrobe” cover art from 1950s to the e-book today.